Amazing Winter Divina Latina Sweepstakes: Win $1000 in Walmart Gift Cards (11 Winners)! Wanna look your very best whether during a party or while on the run? Fashion expert Kika Rocha has created 5 fashionable looks that will make you feel famously beautiful every day! 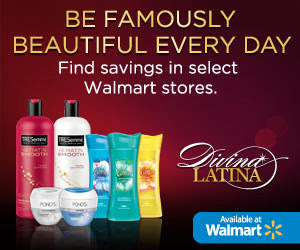 Stop by Divina Latina at Walmart for exclusive tips, look books, and products to help you get a fabulous look for less. Plus enter the Amazing Winter Divina Latina Sweepstakes for your chance to win a $500 Walmart gift card or one of 10 $50 Walmart gift cards! POND’s Crema S is a daily moisturizer that nourishes for up to 24 hours resulting in soft, healthy-looking skin. It’s dermatologist tested, hypoallergenic and won’t clog pores. Experience freshness like never before with Caress Body Wash. Sparkling scents surprise your senses while a lush lather envelops your skin leaving it delicately scented and beautifully fresh. One Grand Prize winner will receive a $500 Walmart gift card! Ten winners will each receive a $50 Walmart gift card! Giveaway ends 12/28. Open to US 18+ only. Please enter using the form below. Come back daily to grab more entries. Good luck!